Children like to run riot, play games and have fun, but if you plan on having children at your wedding, you may want to provide outlets for their boundless energy to ensure that roaming gangs of children don’t unintentionally thwart your perfectly planned wedding day! Here are some tips on how you can keep children entertained at your wedding. Firstly, when planning the seating arrangement, put children sitting as designated children’s tables. 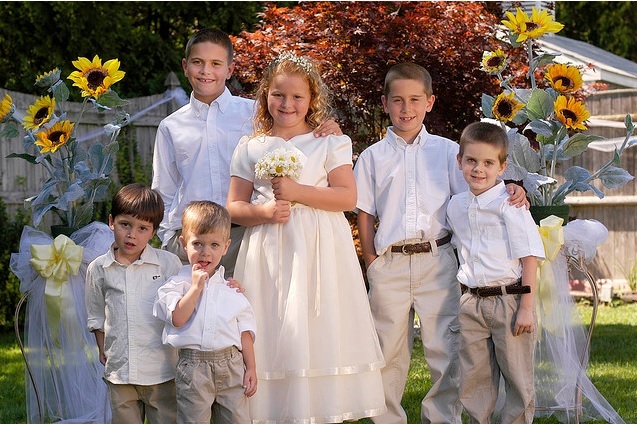 Children are much more likely to enjoy the wedding if they are with their peers on the day. They can chat and have fun while their parents enjoy adult company at their tables, so everyone’s happy. If you’re worried about noise levels, you could have the children’s tables far away from the main table. This way, the bride and groom can enjoy their day and the children can have as much fun as they like without having to be constantly hushed. Pre-arranged entertainment for the children will be a load off your mind when it comes to the big day. Depending on the venue for your reception and the weather, you could hire a bouncing castle for the children to keep them entertained. Bouncing castles are a great option because children simply never tire of them so they’ll be kept busy for hours on end. If yours will be a winter wedding, you could have a children’s room at the venue. You could encourage parents and children to bring along children’s toys and you could provide a box of fancy dress items or group games like Twister or Jenga. On Martha Stewart’s wedding website, she suggests organising a scavenger hunt for children. All you need for this is disposable cameras, pencils and a checklist. Each item on the checklist needs to be found and photographed by the kids. She includes a number of things that children should be able to find easily enough at most weddings, from ‘some fancy flowers’ to ‘two people holding hands’. Your rookie photographers could even provide the material for a cutesy second wedding album, this time from a child’s perspective. Don’t forget that children like to copy adults, so do try to include them in some of the wedding activities. Children, unlike adults, are usually not very self-conscious about dancing, so you could have the children get people onto the dance floor by having the DJ announce that all children have to find an adult to dance with. This will fill up the dance floor in no time! Your wedding day is likely to be one of the most significant days of your life. By taking some of these measures to ensure that children are kept entertained on the day, you can breathe easy when the day finally does come around, comforted by the knowledge that the children are being looked after and that you won’t have to worry about them running riot and ruining your day. This article was written by Victoria Bennett, a wedding planner who often advises couple to hire bouncing castles to keep children entertained.